Finally, the long and very dark days of a January Winter are over! Spring, surely is around the corner. Its been a busy time for me this past couple of weeks and I should have added an update sooner but I really have been so busy with meetings, visiting residents and working through ongoing case-work. The last time I wrote here I stated that there had been a family bereavement and only now, some weeks later, do I feel, with the funeral past, there is a little closure. Moving on though is never going to be easy and grief can hit often and when we least expect it too. Fortunately I have a family around me, I cannot begin to imagine how difficult this process would be if I did not have that support and love around me - which I very much realise not everyone has. 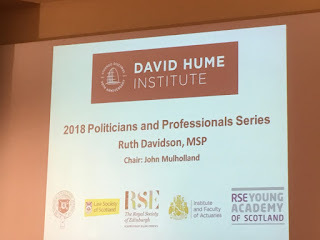 I attended a lecture at the Hume Institute in Edinburgh which was given by Ruth Davidson MSP, leader of the Scottish Conservative Party. The topic was Scotland and Brexit. Needless to say this is an emotive and challenging topic. Ruth engaged the audience well and handled a series of challenging questions. Whilst I enjoy the lecture sessions the Institute puts on, there seems to have become a focussed narrative of pretty much one topic...(Suffice said there, I think). The end of last month saw the Kirkcaldy Area Committee hold the first meeting of 2018. First topic on the agenda was the proposed recommendations to continue the discounted parking rates in Kirkcaldy Town Centre - until 31st March. Thereafter, they would be up for review. The High Street in Kirkcaldy, like in so many towns across the UK, has suffered from retail closures, banks leaving and the continued growth of out of town retail parks and online shopping. Encouraging customers to visit their local high street is proving to be more and more of a challenge. Kirkcaldy lost Tesco in 2015 and then BHS in 2016, RBS closed their branch and now it has been announced that Next is leaving (due to its expansion at the retail park). I do wonder how long Marks & Spencer will continue to remain. On a visit to Kirkcaldy museum last week I noted that in 1950 there were 216 non-food shops and 135 food shops on the high street, a far cry from today. 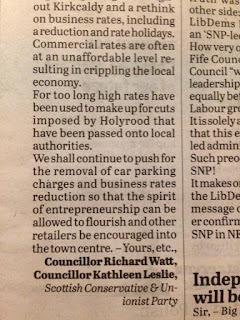 • Requests that a range of options for reduced business rates and business rate holidays on Kirkcaldy high street are explored, and a paper is brought to the next Kirkcaldy Area Committee for decision. Labour also put up an amendment to the recommendations, however, our first 2 points were accepted onto a conjoined amendment and the latter two being recognised as needing a report to be produced. 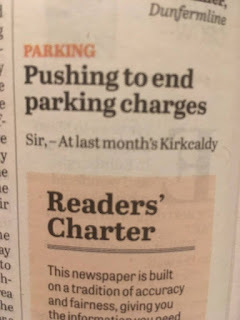 The Administration will publish their Budget proposals tomorrow so it will be interesting to note if any consideration of parking both in Kirkcaldy and across Fife will appear. The matter will also come back to the next Area Committee, so watch this space. 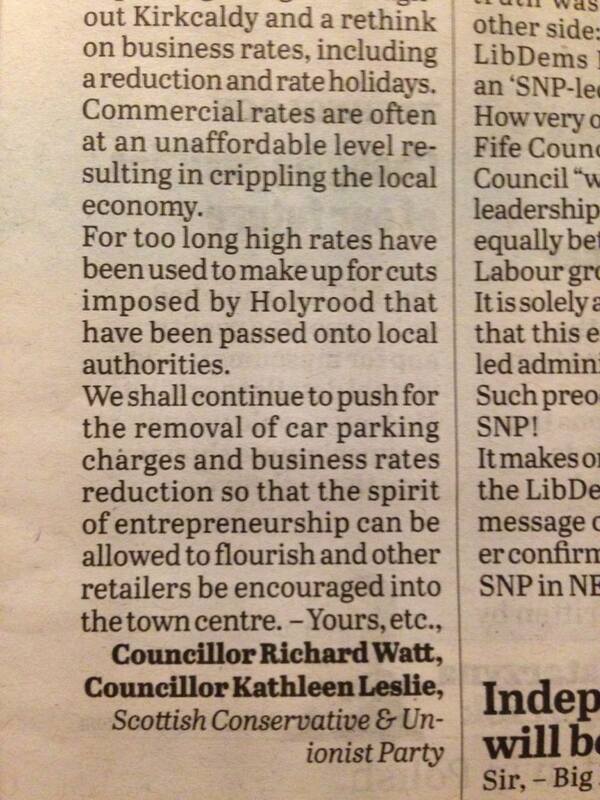 The letter below was published in the Fife Free Press. 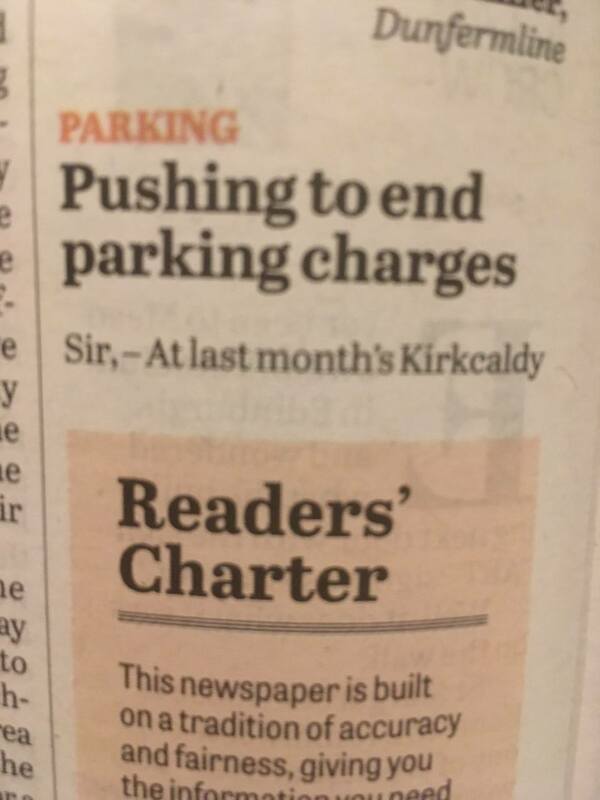 At last month’s Kirkcaldy Area Committee, councillors were asked to rubber-stamp a report reviewing discounted parking charges in the town. The recommendation was to support the current discounted rates until 31st March, which would require an additional £29,000 from the Local Planning Budget, and then end the parking initiative. 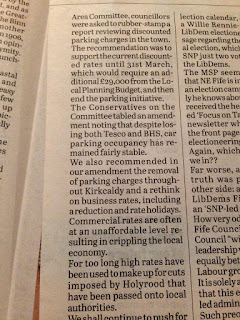 The Conservatives on the Committee tabled an amendment noting that despite losing both Tesco and BHS, car parking occupancy has remained fairly stable. 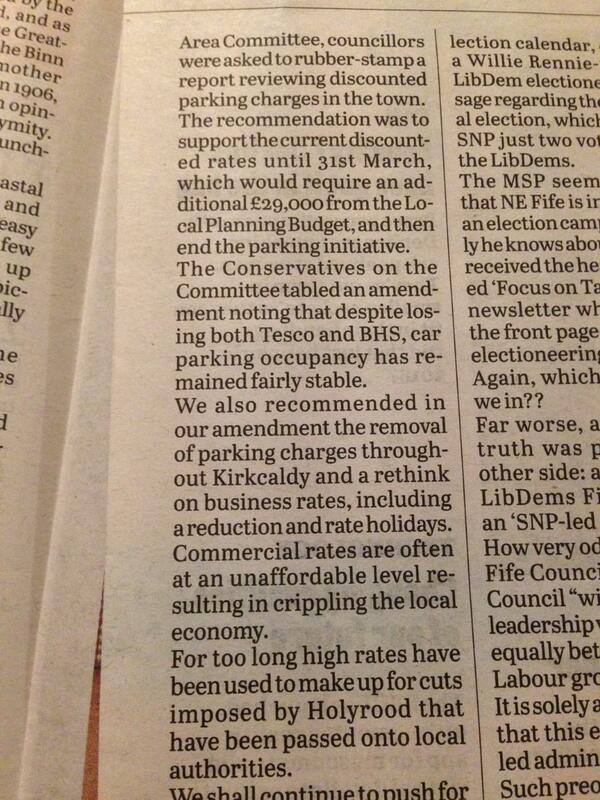 We also recommended in our amendment the removal of parking charges throughout Kirkcaldy and a rethink on business rates, including a reduction and rate holidays. Commercial rates are often at an unaffordable level resulting in crippling the local economy. 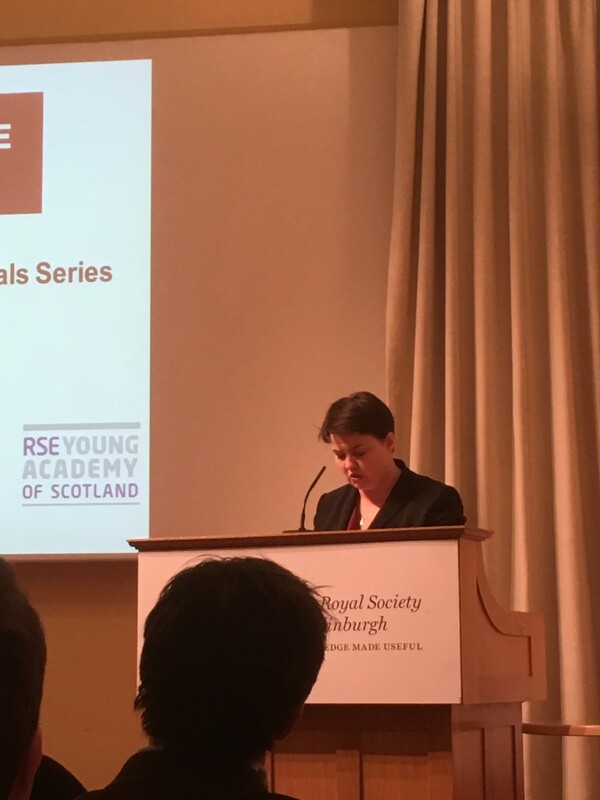 For too long high rates have been used to make up for cuts imposed by Holyrood that have been passed onto local authorities. We shall continue to push for the removal of car parking charges and business rates reduction so that the spirit of entrepreneurship can be allowed to flourish and other retailers be encouraged into the town centre. 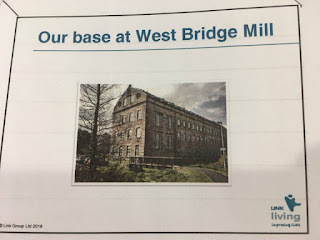 Last week Liz Smith MSP for Mid Scotland & Fife asked a question of the Transport Minister in regards to concerns raised by commuters on the Fife Circle. Here is the question and the response. 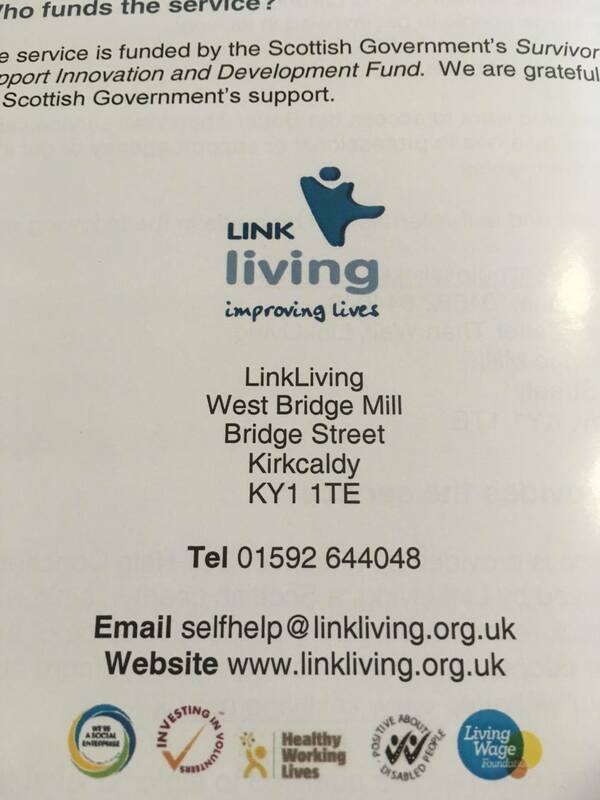 Please do continue to share and contact me with your experiences of this service. As I said to Alex Rowley in the chamber last week, I completely understand the frustrations of poor performance for the customer experience, and I recognise that ScotRail has faced a number of issues and challenges across the rail network, particularly in the recent autumn and winter months, and not least in the Mid Scotland and Fife region. I fully expect the performance issues to be addressed immediately. I speak regularly to Alex Hynes and, as I have mentioned in the chamber and as I think Liz Smith is aware, ScotRail has instigated an independent review to look at performance, and stop-skipping will be part of that. My Transport Scotland officials will continue to monitor the situation closely. At last week’s general question time, I agreed to organise and facilitate a meeting with Fife MSPs, and I believe that Liz Smith has responded positively to that. We are still waiting for diaries to co-ordinate for one or two MSPs, but that meeting will take place. At that meeting, we will be able to hear from ScotRail how it looks to improve its performance and minimise stop-skipping. I thank the minister for that answer and acknowledge his willingness to discuss the matter. It is very good news that members will be permitted to meet him and Alex Hynes later this month. 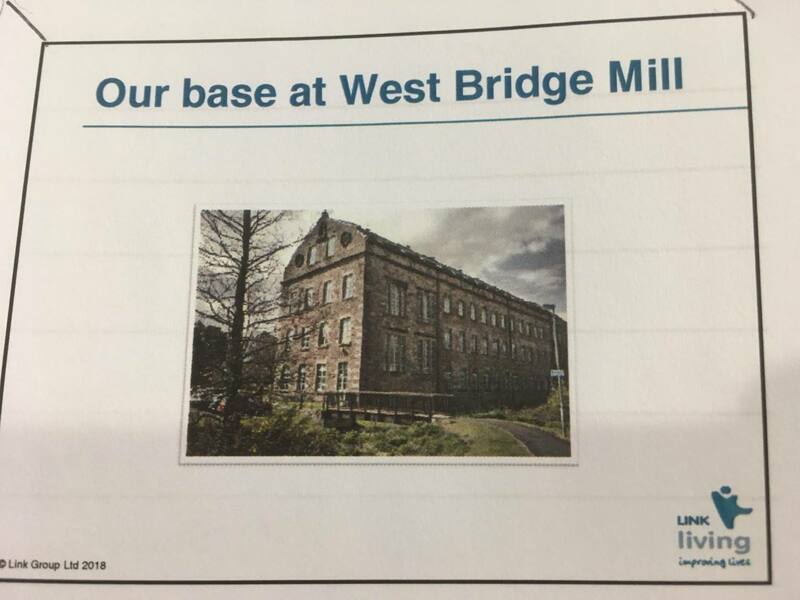 However, we all await the important answers, not least because of the safety issues, to the questions that were raised on stop-skipping in their regions by Christine Grahame and John Finnie. Can the minister put on the agenda for the forthcoming meeting the alleged congestion on the central Fife lines and the accuracy—or inaccuracy, in some cases—of the notice board information at stations when such problems arise? As a follow-up to this, I was advised last week that Burntisland and Kinghorn are no longer going to be facilitated as stations where trains "skip" stops - therefore, if you do experience this it is important you let me know. 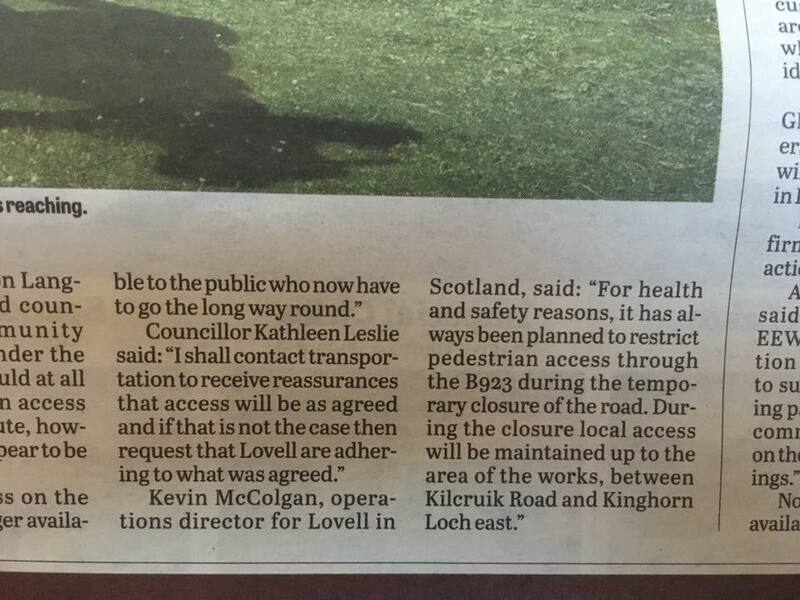 As most of you will know the Loch Road will continue to be closed until April. 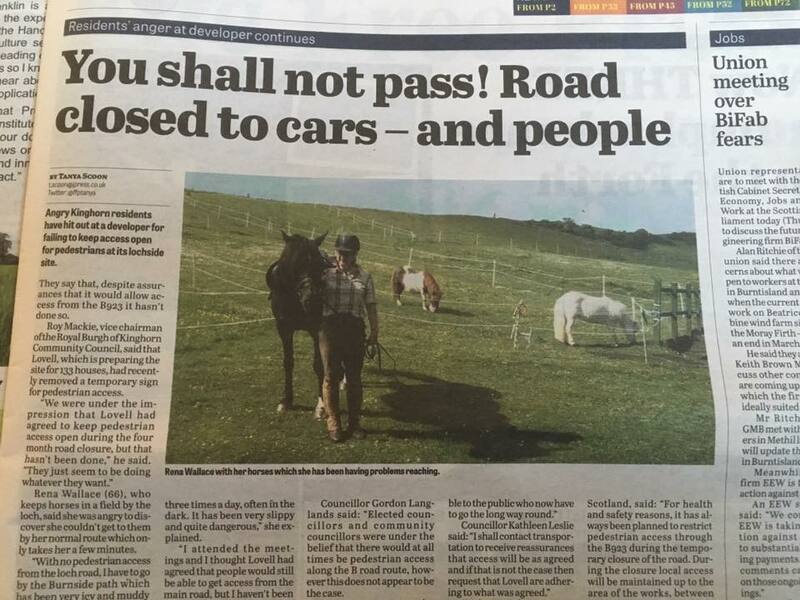 I am less than satisfied though with Fife Council's Transportation Department's handling of this. Pedestrian access is an ongoing worry, despite assurances to the contrary by the developer. 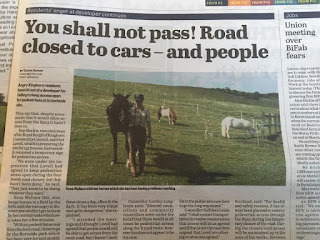 Pedestrians - many of whom are dog walkers, are now having to navigate a small section of road with no pathway and temporary fencing. My most recent email to Transportation has been met with no response. I will be writing to them again this week asking for further information. I have spoken to a number of residents in regards to their ongoing concerns. If you have any concerns or questions do please get in touch and I will continue to push for answers. 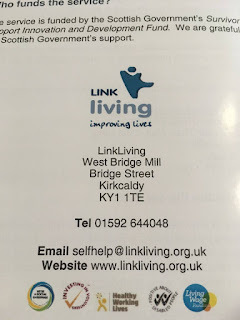 I attended the Linktown and Invertiel NDP at the end of January, which brings together Fife Council, councillors, residents and other interested and local groups. 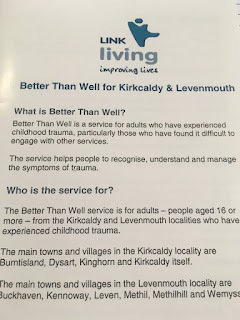 A presentation was given by Link Living, which is Kirkcaldy based and their "Better Than Well" initiative. 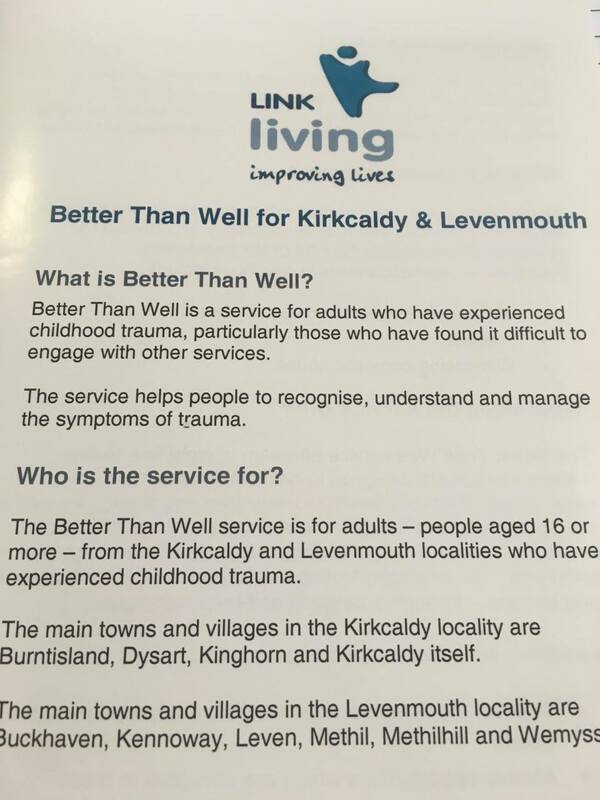 Better Than Well is a service for adults who have experienced childhood trauma, particularly those who have found it difficult to engage with other services - or who have long waiting times to access other services. It can help to recognise, understand and manage the symptoms of trauma. The organisation is based at West Bridge Mill (just across from Invertiel). A short update on the ongoing littering issue around the viaduct. Short because the problem appears to be almost gone! Success! I had an excellent meeting with the Chair and Secretary of Invertiel TRA (in Morrisons - great place for a coffee and to meet and chat with residents) and it is felt that much has been done by the school to alleviate the littering problem. I just need to have a follow-up meeting with the school as to how to manage this in the long-term (I was unable to attend the most recent meeting with the prefects at the school due it having been scheduled on what became the day that we suffered a family bereavement). Once I have spoken with the school I will provide a longer update. Meantime, I think it is fair to say that when different groups, communicate and constructively work to get through a problem, there is a good chance of a positive resolution! Something we all perhaps need to consider in different aspects of life. A few weeks ago I visited Auchmuty High School in Glenrothes to learn more about an initiative run by "Glam Candy" (a make-up and beauty college) who are offering an SQA approved course in make-up to a group of senior pupils. I was slightly dismayed though to learn that no other high schools in Fife had so far taken up this fantastic opportunity that not only leads to a qualification but also builds and develops confidence, self-esteem and has encouraged pupils to continue to focus on literacy and numeracy. 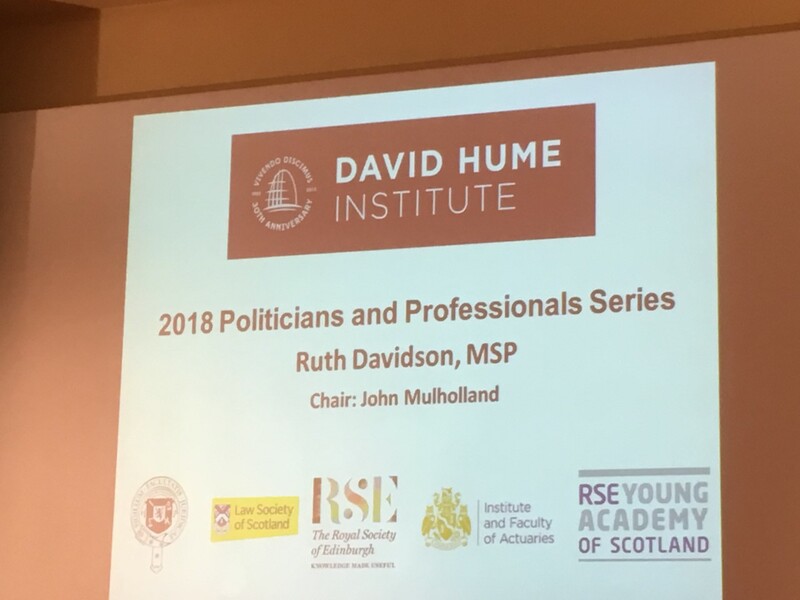 I think this is a wonderful initiative with enormous potential - both this course and the possibilities of other, as yet untapped, vocational courses, that open up different routes for pupils post-school. I am delighted to report, that following raising this with the Eduction Directorate, its has been agreed to find support for this initiative in other schools through their employability strategy. Here is a link again to the coverage the course received in the media. 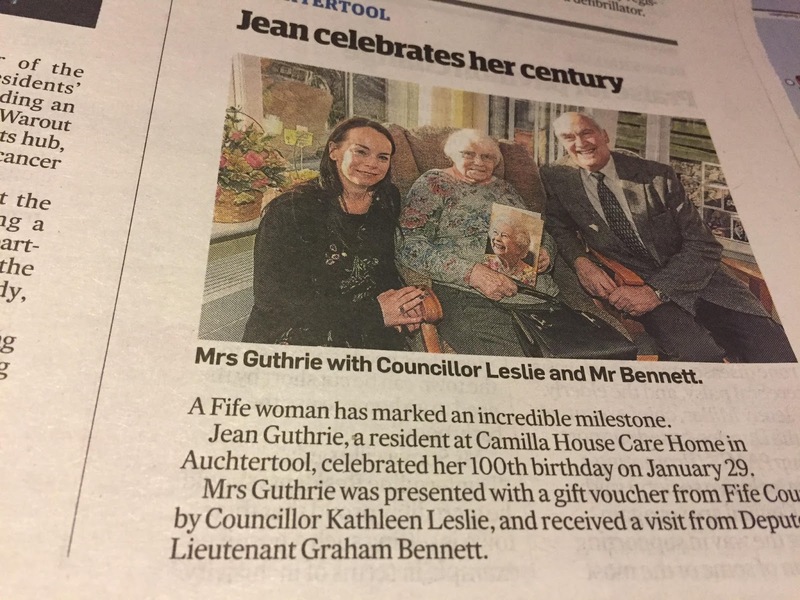 At the end of January I was honoured to be invited to a celebration of a 100th birthday for Auchtertool resident, Jean Guthrie. Along with the Depute Lord Lieutenant of Fife I presented a card signed by Her Majesty Queen Elizabeth II. It was a lovely celebration shared by extended family and well-wishers. For me it was also a rather poignant moment given the circumstances of the past few weeks. This week I attended Auchterool Community Council where the issue of speeding in the village and a lack of any traffic island or crossing at the school was mentioned. I have requested this be added to the agenda of the next Ward meeting that myself and my fellow Ward 9 councillors are having in two weeks. Last Friday I met members of the Kingdom Credit Union at the Philp Hall in Kirkcaldy. Credit unions are mutual savings and loans societies and provide a low-cost banking alternative. They are not-for-profit organisations and all members become a part owner. Kingdom Credit Union is in the Philp Hall every Friday from 10:30am - 12:30pm. This week our group of councillors in Fife met with the Director of the Scottish Conservative Party, which gave us a chance to discuss our vision for Fife, to ask questions and also to be offered some fantastic advice. We were reminded that as councillors we are there to represent local residents. Whilst committee and Council work is extremely important, ultimately residents elected us to be there to provide a place to go when they are in need of assistance. 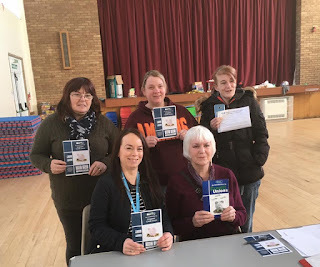 Whether it be dog-fouling (a long running issue in part of my Ward), pot holes, litter, concerns about road closures or advice on applying for a Blue Badge - these are the important issues. 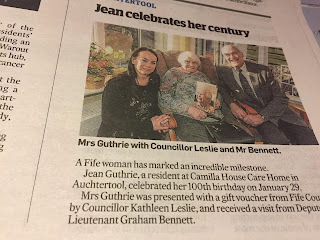 These are why councillors get elected. People put their trust in us to get out there and represent them. Yes, we represent a political party and the political direction of the party is very much in our minds and in how we approach and consider topics at Committee but we are also there to represent you. All of you. Regardless of whether you voted for us or not. This is never far from my mind when I go about my day to day work - answering emails, calling constituents, holding councillor surgeries, attending community council, Parent-Teacher Councils and TRA meetings and providing that vital link between resident and the Council. I do believe the majority of elected representatives, whatever their political colours, do have at the heart of what they do, the belief that they are there to listen and represent all of their constituents fairly. To ensure that people have a voice. Being a politician is perfecting the balancing act of the responsibility to party whilst at the same time continuing to be reminded that we only have the privilege of doing so, whether at the local or national government setting, due to the will of the people. This year is a century since the first women in the UK got the vote (only those over 30 did though in 1918), it is difficult to imagine a time when we did not yet we are reminded of it almost daily on the news when we see parts of the world where women still do not have full and equal rights. It is also a reminder of our democratic right and the importance of exercising that right at the ballot box. I sometimes am asked why I decided I wanted to do this. It is not for writing about in this post (it will simply take too long here) but I had dreams of being elected, albeit as an MP, back when I was at high school. I wanted to it then because I had a deep belief in wanting to serve. To be able to serve and represent people. To also provide a voice and to ensure that all people have the belief and the ability to aspire and be able to realise their full potential. As one of my colleagues is always keen (and correct) to remind us - it is about being out there and being seen and accessible and representing individuals and groups. It is about being that local champion. If you don't aim to be that then you are in the wrong job!